Sakurajima is an island with a big volcano which is the most known symbol of the city of Kagoshima and one of the most active and most studied volcanoes in the world. This island actually is no longer an island, it has become a peninsula since 1914 when a powerful eruption produced so much magma to connect it to the mainland. 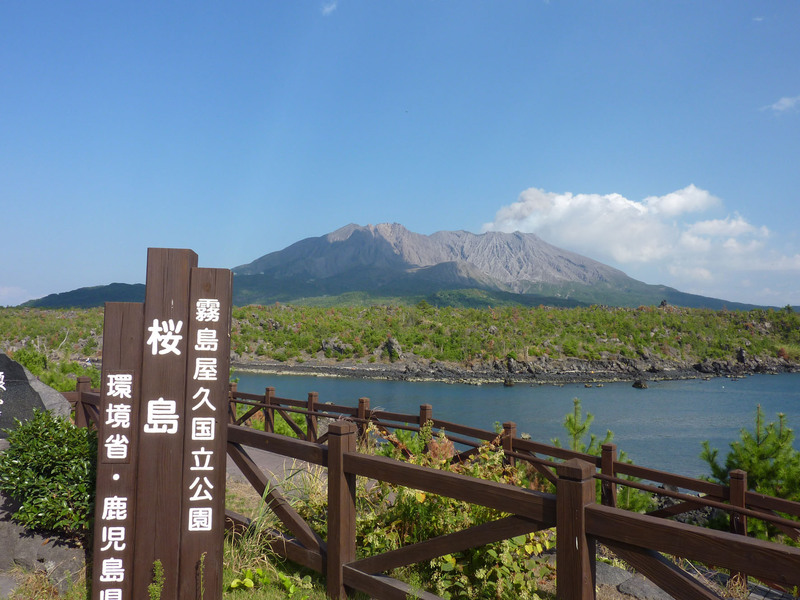 The former island of Sakurajima is today connected with the Osumi Peninsula to the east and separated from Kagoshima by a stretch of sea of about 3 km to the west. The most common way among tourists to reach Sakurajima is, however, to take a ferry from the port of Kagoshima (15 minutes, 160 yen), which will bring you to the dock in the western part of the island. Once you get off the ferry, you can walk to a number of attractions located nearby. The main shrine of the island, it is located right in front of the dock. It's a small Shinto shrine as many others in Japan. Within this structure you can find a gift shop and local products, and some exhibits and information on the volcano, on past eruptions and the ecosystem of the island. A park located on a hill near the dock. 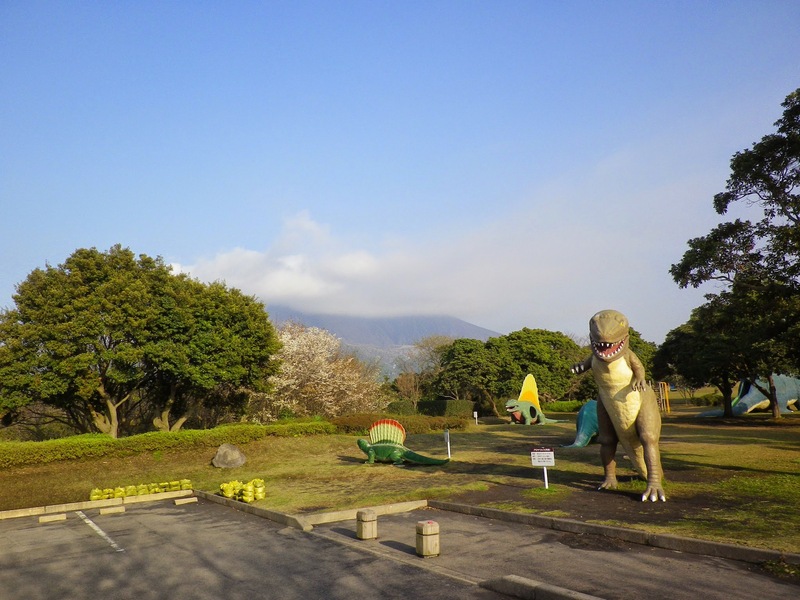 Inside the park you can find some big statues of dinosaurs and various games including a huge 12 meters long slide. A place where to bring your children to play around. This is a public onsen, which also includes a sauna, belonging to the nearby Rainbow Sakurajima hotel (see below), but it is open to everyone, not just to hotel guests. Therefore you can go and relax with a hot bath with a panoramic view of the sea, but the water is very hot, so usually people do not stand in water for more than 15-20 minutes. A brief stop at the end of the day spent exploring the island, before returning to Kagoshima, might be the best. Bring a towel if you do not want to rent it on site (200 yen), and soap and shampoo to wash your body before entering the water are available for free. A park located along the coast, a short walk from the dockside, here you can find free hot springs for feet. It is an ideal place where to relax and rest your feet while enjoying the view of the sea and the coast of Kagoshima looking at one side, and of the volcano looking at the other side. 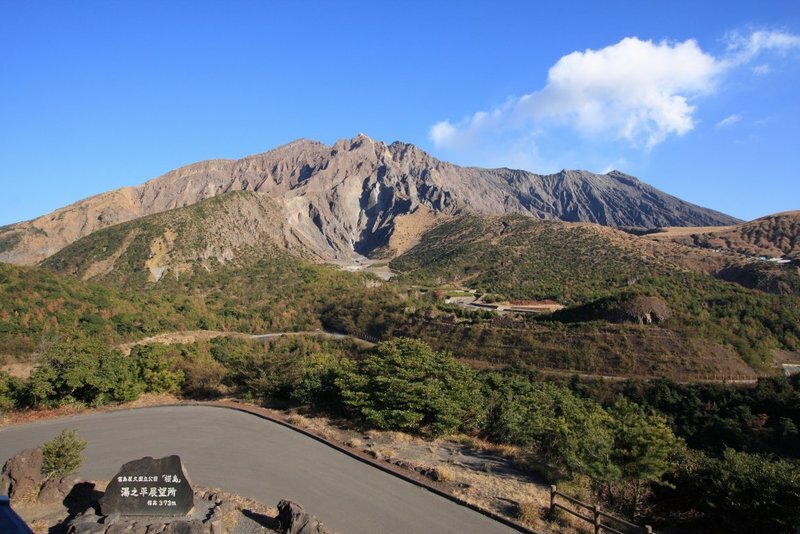 This trail begins near the Sakurajima Visitor Center, and is about 3 km long passing through an area covered with lava dating back to the last major eruption in 1914. 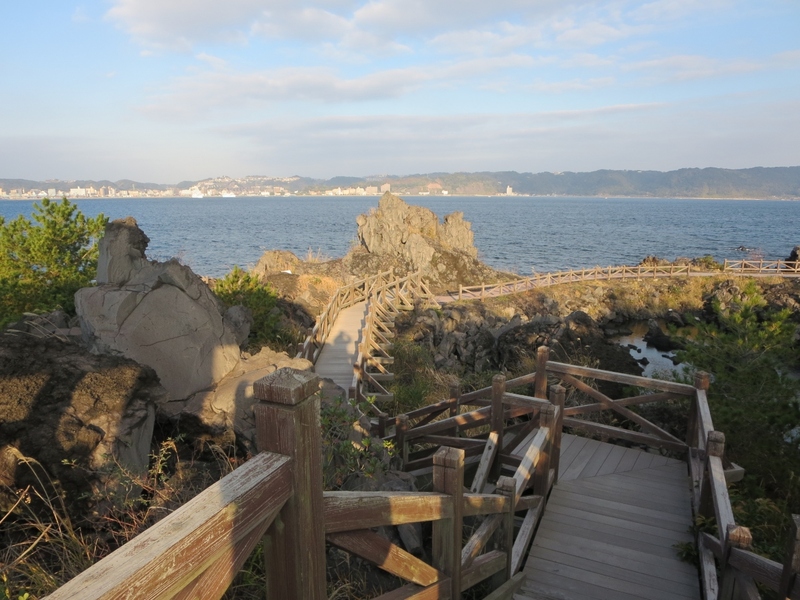 If you walk to the end of the path you will reach a vantage point known as Karasujima. This place was a small island 500 meters away from Sakurajima until before the great eruption of 1914, and which has since been incorporated in the island. Through this bus, which leaves from the port of the island, you can reach some neighboring observation points (Torishima, Akamizu, Yunohira). There is about one departure per hour, and the route of the bus is organized precisely to allow a quick tour of the western part of the island. The bus stops in the three viewpoints mentioned above for a few minutes, giving you time to get off and take some pictures. In particular, the bus makes a stop of 15 minutes at the observation point of Yunohira, which is the highest point reached, at about 373 meters above the sea level. The full tour, leaving from the port and getting back to the port, takes about one hour including the time for the stops. The price varies depending on the stop you get off, but you can buy a day ticket for 500 yen by which you can get on and off from this line as often as you want. Getting to the rest of the island is not easy by public transport. There should be some public bus going to the other areas of the island but just a few per day, and it is very difficult to find information online, even in Japanese. If you want to make a full exploration of the island, consider the idea of renting a car and go around autonomously, or join some guided tour. The guided tours of the island usually leave directly from Kagoshima and you can find more information at the tourist information centers in the city of Kagoshima. The only point of interest along the northern side of the island. It is a public onsen. Frequented mainly by locals who inhabit the island rather than tourists. I think that really very few westerners over the years have come this far. Located in the southern side of the island, this observatory is located on a hill formed during the eruption of 1914. In this place, located along the east side of Sakurajima, there is an old entrance gate (torii) of a Shinto shrine which no longer exists. The peculiarity is that this torii, as well as the whole area, was covered with ash during the great eruption of 1914, and observing what is still visible of this torii, that is only the upper end, you can see how the eruption and the amount of ash released had raised the level of the ground. 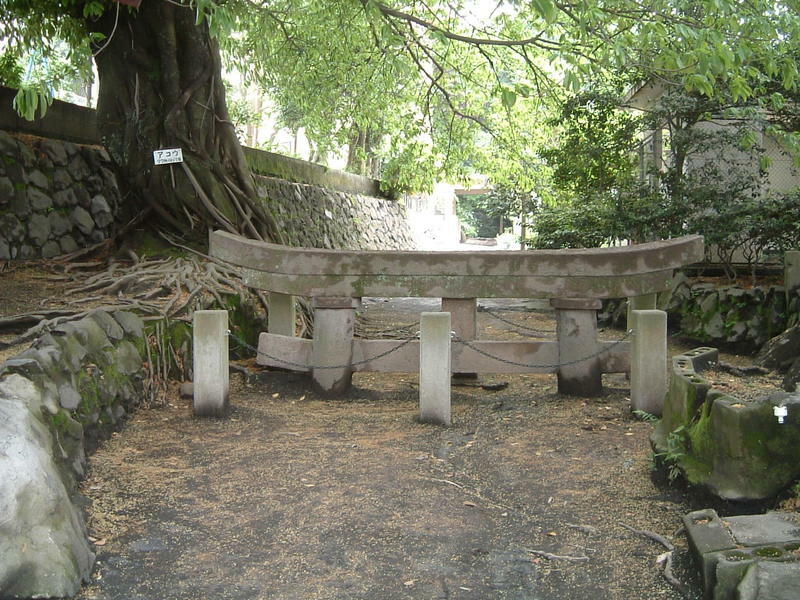 The name Kurokami refers to an observation point located near the buried gate. From this viewing point you can admire the continuous volcanic activity of the most recent crater, the Showa crater. 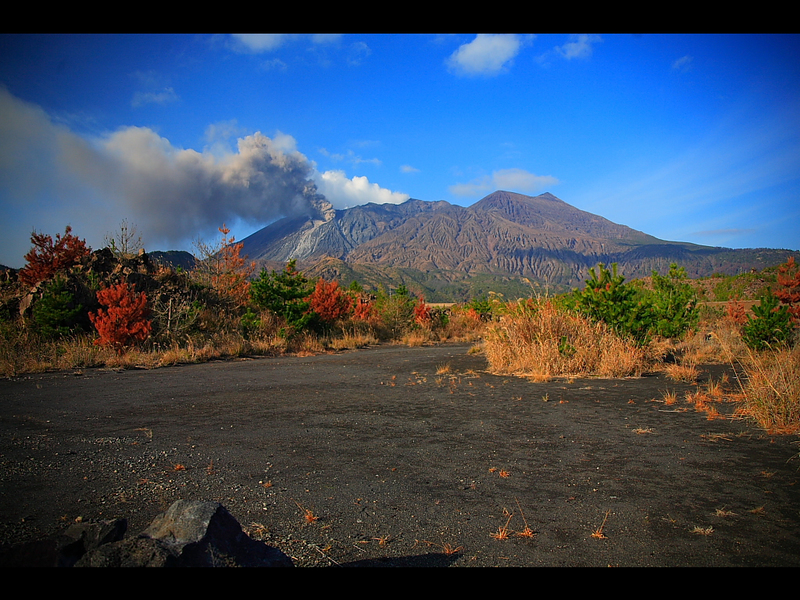 The only accommodation of Sakurajima that can be found on booking.com. It is a sort of ryokan that offers both Japanese-style rooms that Western-style rooms. Spacious rooms, some with sea views. Packages including breakfast or half board are also available. This hotel also runs a public onsen nearby, known as Magma Onsen (see above), whose entrance costs 300 yen per person. Fares from 7,000 yen per person per night, from about 10,000 yen in halfboard. 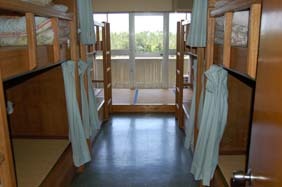 This hostel is the cheapest accommodation on the island, with dormitory beds from 2,650 yen per night. Breakfast costs 524 yen, dinner 730 yen. You can also rent bikes for 200 yen a day. This hostel can't be found in any hotel reservation portal, the website is only in Japanese and you can not book online, the only way to book it is to call their phone number if you can speak a bit of Japanese. 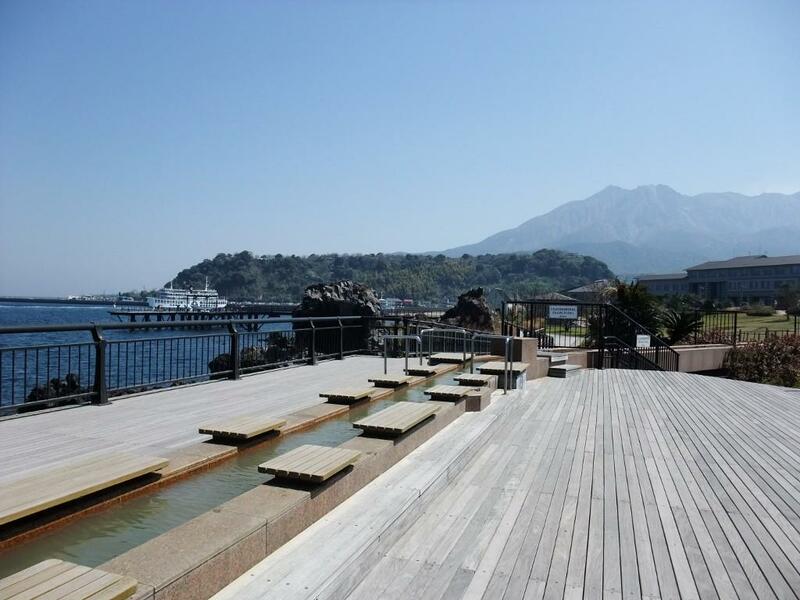 Wonderful hotel with onsen located along the south coast of Sakurajima, facing the sea but away from it all. A lovely place where all the rooms have sea views, and even the onsen overlooks the sea in a unique atmosphere. The restaurant serves delicious kaiseki-style dinners. This hotel is not located in any hotel reservation portal, the website is only in Japanese, but you can book online through their website. 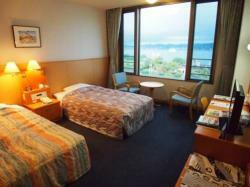 This hotel is located along the south coast of Sakurajima, next to the previously described Sakurajima Hotel. 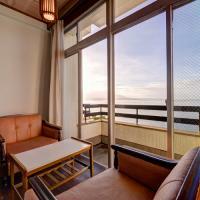 This hotel also faces the sea and offers fine views both from the rooms and from the 'onsen. All rooms are traditional in style, as in ryokans. Booking this hotel is easier than its neighboring one because you can do it on Rakuten. 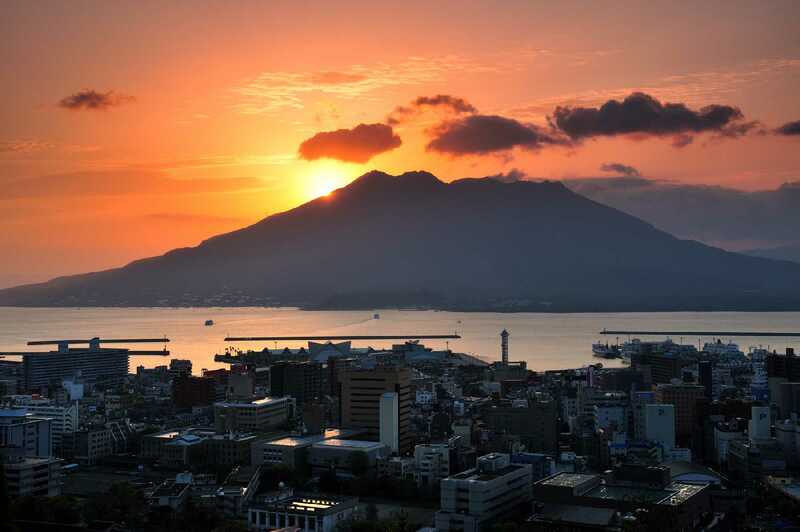 As already mentioned, Sakurajima is no longer an island since 1914, and is nowadays connected to the Osumi peninsula by a strip of land on which was built a paved road. The Osumi Peninsula is however a little known area and is not very easy to get there, this is the reason why the main access to the former island of Sakurajima is still the sea. From the harbour of Kagoshima you can take a ferry (adults 160 yen, children 80 yen) and get to the western side of Sakurajima in 15 minutes, with departures over the entire 24 hours. The number of departures ranges from a minimum of a departure every hour during the night to a maximum of a departure every 10 minutes during certain peak times of the day. It should be emphasized that this ferry service between Kagoshima and Sakurajima is not only to tourists, but above all for the inhabitants of the island who have to travel to Kagoshima for most of their needs (for example hospitals, schools, etc.). It is also possible to take your own car on the ferry, for example in case you have rented one, the fare is 1,150 yen each way.